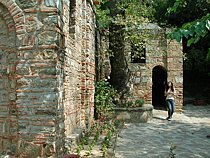 The House of Virgin Mary - The belief that the Virgin Mary had spent her last days in the vicinity of Ephesus and that she had died there, focused attention on a nun named Anna Katherina Emmerich who had livid in the late 18th century (1774-1820). 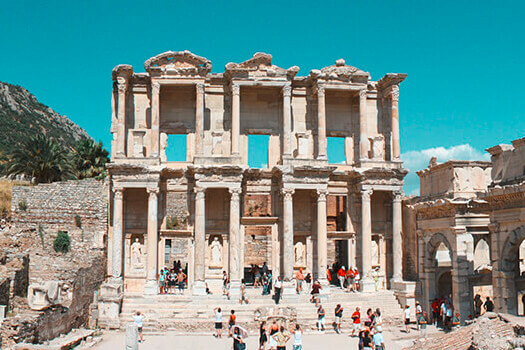 The efforts to find the house were greatly influenced by her detailed description of the Virgin Mary's coming to Ephesus, her life and her last home there and the characteristics of the city although she had never been to Ephesus. In 1811, Emmerich, who had dedicated her life to God, was taken ill in the nunnery and had to keep her bed. She was hearing voices no one else did, and was having religious visions. On 29 December 1812, as Emmerich was praying in her bed with her hands stretched out, she was suddenly shaken by a divine force; and seized by a high fever, she became deep red in the face. Just at that moment, a bright light coming from above descended towards her and when it reached her the hands and the feet of the sick woman were suddenly covered with blood as if pierced by nails. The people around the bed were stunned with amazement. It was as if she had partaken of Christs agony during the Crucifixion and had become a stigmatized nun. The doctors examining her were greatly astonished. They could not explain this within the science of medicine. A writer named C. Brentano began putting into writing the narrations that Emmerich, who getting gradually worse had become bedridden, revealed in trance after loosing consciousness in 1811. "After completing her third year here she had a great desire to go to Jerusalem. John and Peter took her there. She was taken so ill and lost so much weight in Jerusalem that everybody thought she was going to die and they began preparing a grave for her. 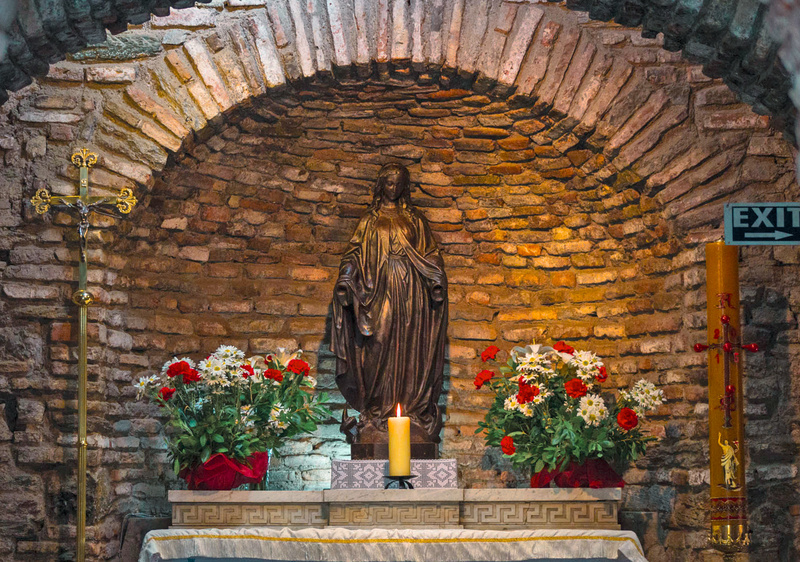 When the grave was finished the Virgin Mary recovered. 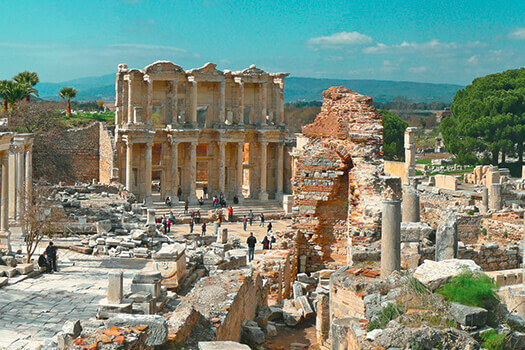 She was feeling strong enough to return to Ephesus. 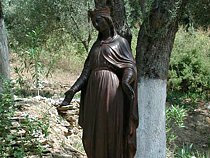 After returning to Ephesus the Virgin Mary became very weak and at 64 years of age she died. 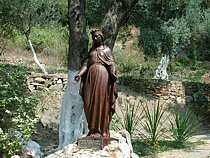 The saints around her performed a funeral ceremony for her and put the coffin they had specially prepared into a cave about two kilometers away from the house". "When they came to the cave they prostrated themselves. Thomas and his friends walked impatiently to the door. St.John followed them. Two of them went inside after removing the bushes at the entrance of the cave and they kneeled down in front of the grave. John neared the coffin of which a part was protruding from the grave and unlacing its ties he opened the lid. When they all approached the coffin they were stunned in amazement: Mary's corpse was not in the shroud. But the shroud had remained intact. 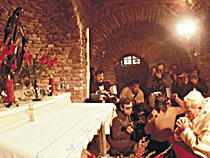 After this event the mouth of the cave containing the grave was closed and the house was turned into a chapel." A French clergyman named Gouyet who after reading in 1880 C.Brentano's book " The Life of the Virgin Mary" containing the revelations of Anna Katherina Emmerich tried to prove these by his writings but was not successful. 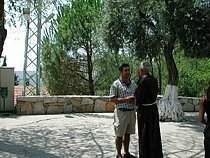 Gouyet dedided to go Ephesus to see whether the house mentioned as beloning to the Virgin Mary fitted the description in the book or not. Monseigneur Timoni, the archbishop of Izmir of the time, supported him in his idea and gave him a helper. After a journey free from problems in contrast to his expectations, Gouyet saw the house, believed that it belonged to the Virgin Mary and sent his related report to Bishopric authorities of Paris and even to Rome, but he did not receive the attention he had expected. 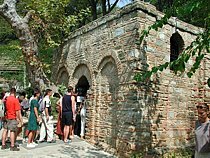 About ten years after this event, H.Jung, a Lazarist priest who had read in Anna Katherina Emmerich's book the chapters relating to the life and death of Virgin Mary in Ephesus, decided that it would be useful to see the house in its place. With the encouragement of Sister Marie de Mandat Grancey, the handnurse of the French Hospital of Izmir, he organized a second research team with the collaboration of Eugene Poulin, a Lazarist priest who was the director of the French College of Izmir and who had studied Emmerich's book. The team consisting of two preists and two Catholic functionaries set out on 27 June 1891. 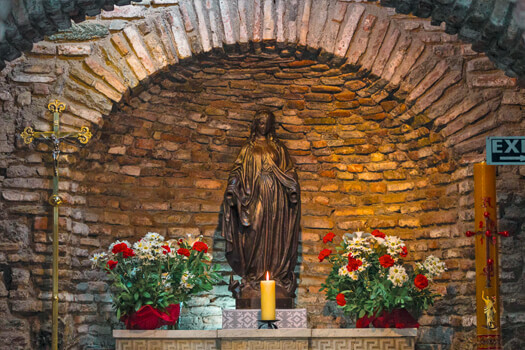 The team successfully found the House of Virgin Mary, they had discovered a small place of workship with the roof fallen in and the walls in ruin standing a statue of the Virgin Mary with the hands broken off. Nowhere else in the region was there a scene fitting the description as perfectly as this one did. They returned to Izmir. 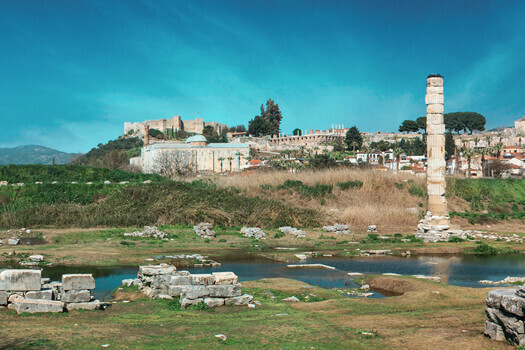 The priest E.Poulin, although he did not quite believe the narrative of his colleague Jung, decided to go to Ephesus to see out on the journey and on his return he let work begin for the necessary scientific research. With four friends he went up the Bulbul mountain again they took various photographs pf the place for a week. Meanwhile, the archbishop of Izmir Monseignor Timoni showed interest in the matter. He organized a team consisting of seven priests and five specialists. This team went up to the house of the Virgin Mary in December 1892 and substantiated the situation by a duly signed document ( History of Panaya Kapulu). After the priest Jung set out on his first expedition, Sister Marie de Mandat Grancey exerted herself for nearly ten months to obtain the right of possession of his land and tried in her own capacity to repair the building and arrange the surrounding area. 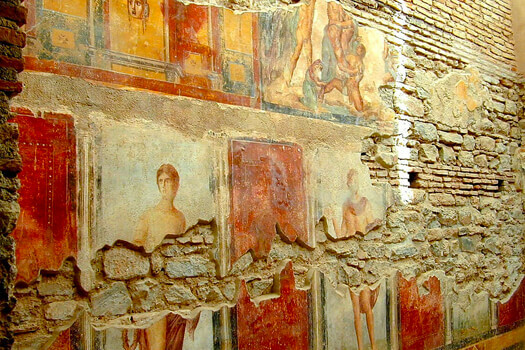 The restoration and other works continued until 1894. A shelter for visitors was built as an annex to the building. This place of pilgrimage visited by thousands of tourists every year, maintains its holiness for the Moslems as well as for the Christian world. People believing in the godly qualities of the Virgin Mary came here and drinking from the water believed to be sacred they make wishes in the mystic and quite atmosphere of Mount Aladag. 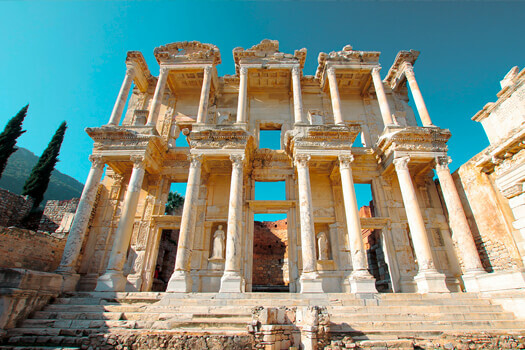 Ephesus is considered one of the greatest outdoor museums of Turkey, in fact perhaps of the world. 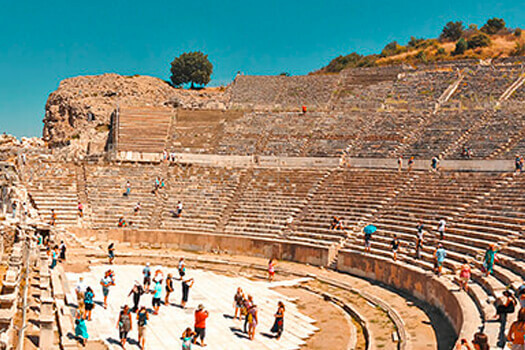 Learn more about Odeion, Temples of the Goddess Rome, Prytaneion, The Gate of Heracles, Curetes Street and more. 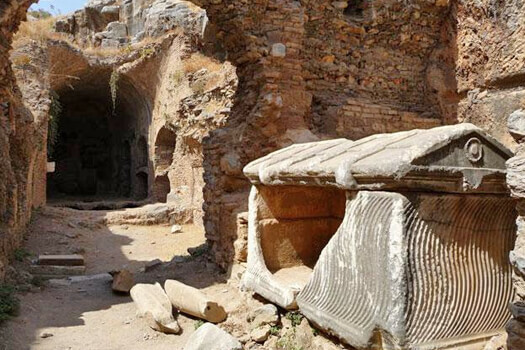 The Terrace Houses in Ephesus consists of luxurious residential houses, next to Curetes Street and opposite the Temple of Hadrian. The building is made of very good marble and decorated with figures of Eros, Nike, rosettes and garlands in relief. The auditorium still used today for seating the public during the performances in the theatre. 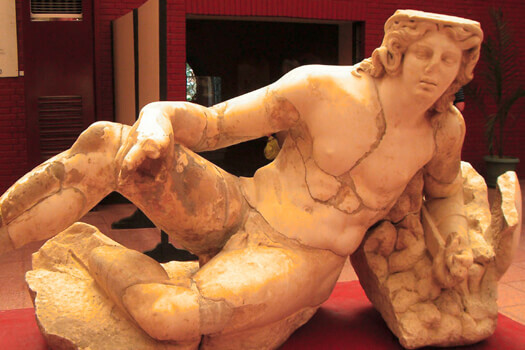 The Museum of Ephesus is in the district of Selcuk, and displays works of art found in the excavations in Ephesus since 1964. 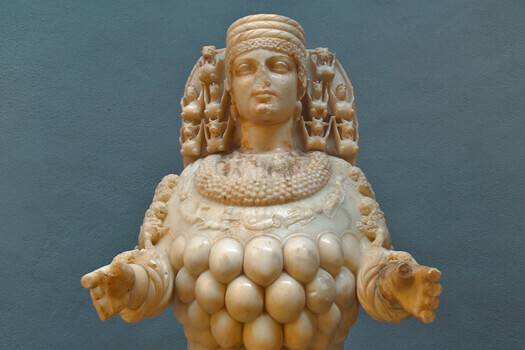 Known as a fierce hunter as well as protector, Artemis is one of the major Greek goddesses. A column and scanty fragments strewn on the ground are all that remains of the Seventh Wonder of the World. The place is also known as the Grotto of the Seven Sleepers and it is now a ruined.